Finally got a delicated laptop bag instead of just putting my laptop into my zeroshock sleeve and then putting it into my bag, taking up precious space and added weight. Got my tri-color Timbuk2 from Fall Factor at Alexandra Village. 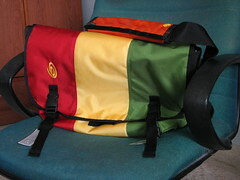 Its a medium Laptop Messenger with red/soft yellow/leaf green colour scheme. Kinda rastafarian. A big messenger bag I must say, now I can lug more junks to school!